This in-depth, 2 hour walking tour is devoted to to exploring the significant locations in the historic French Quarter which was featured in the popular cult TV series, American Horror Story - Coven. Your experienced and knowledgeable tour guide will explain the historical overlaps between the characters depicted in the show, and true stories of their real life namesakes. 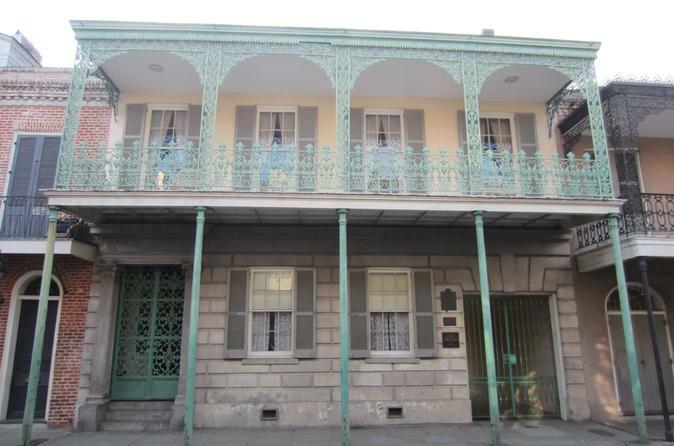 You will learn about the evil murderer Madame LaLaurie and visit the place where her body was exhumed. We also visit the site where the ‘Voodoo Queen’ Marie Laveau once lived. In addition to learning the rich history of these real life characters, and visiting important landmarks from the show and their real lives, you will be taken through the St Louis Cemetery #1 and visit Marie Laveau and Madame LaLaurie tombs as well as Nick Cage’s pyramid tomb. Come with us on this tour and walk in the footsteps of Fiona , Marie Laveau, Madame LaLaurie and the witches among others. You will learn about the historic sites and people incorporated into the American Horror Story (Coven) TV show. You will see where they lived and where they socialized, in addition to visiting the locations where significant events happened, both in the show and in real life! Your guide will provide fascinating facts about how American Horror Story cleverly integrated local legends about witches, voodoo and specific events, such as the burning of the LaLaurie mansion, into the storyline. The guide will explain which characters in the show were actual historical figures. The first stop after this gruesome introduction will be the site where Madame LaLaurie’s body was exhumed by Fiona Goode (Jessica Lange) and her sinister henchmen. Then it’s off to the location where Fiona and the young witches, dressed in black, perform the powerful and chilling “witches’ walk”. From there, you will head over to the magnificent historic house featured on the show as a museum where many interior scenes, both past and present, were filmed. Leaving this location, you’ll head to the St Louis Cemetery #1, where you will visit three very significant tombs. Firstly, you will see the reputed tomb of voodoo priestess, Marie Laveau. Next, you’ll visit movie actor, Nick Cage’s pyramid tomb and learn why he chose New Orleans St Louis Cemetery #1 for his final resting place. The last stop in the cemetery is the tomb of Madame LaLaurie, the infamous sadistic slave torturer who was run out of the city by enraged local citizens. Leaving the cemetery, the next destination is Congo Square, where you’ll learn about its significance in music and the voodoo rituals famously performed there, both in real life and in American Horror Story. You will then visit the site of Marie Laveau’s former home. In those mysterious walls, you will learn more about Laveau’s life and how those facts were integrated into American Horror Story. Now you will head to the location where two of New Orleans’ most popular Voodoo shops are located. Voodoo is a real religion and you will learn about its history, and how it came from Africa and Haiti to New Orleans. Your guide will fill you in on the specific scenes in American Horror Story that dealt with voodoo, hoodoo, and the origin of voodoo dolls in New Orleans. Your next stop is the townhouse where the exterior scenes for American Horror Story were filmed, which is also the location for the torture chamber scenes. The tour ends at the LaLaurie Mansion, where you will be told its dreadful history and terrible legacy. The tour ends here, and you will be able to take pictures and as much video as you like before heading back to visit the museum and/or other historic buildings.